Von der Ahe suspended Breitenstein for part of August and September.19 The Browns finished in 11th place in the 12-team National League. Breitenstein compiled an unimpressive 9-19 record and 4.69 ERA in 282⅓ innings, yet his nine wins were second most on the Browns’ pitching staff. In 1896 St. Louis again finished in 11th place, with Breitenstein earning 18 of the team’s 40 victories. The Cincinnati Reds acquired him after the season for a reported $10,000. Thrilled to leave Von der Ahe, Breitenstein demonstrated what he could do on a good team. In 1897 he compiled a 23-12 record for the fourth-place Reds, including 10 consecutive victories from June 11 to July 18. The Cincinnati Enquirer said, “Some of those who in the early spring used to refer to Breit as a ten-cent counterfeit, are now quite ready to take off their hats to him as the only genuine, blown-in-the-glass, Ten-Thousand-Dollar-Beauty in the business.”45 Breitenstein enjoyed his three-hit shutout of St. Louis on June 30, with Von der Ahe looking on.46 Without Breitenstein, St. Louis won only 29 games; the 1897 Browns, with a .221 winning percentage, rank as the second worst major-league team between 1891 and 2014. Breitenstein’s arm troubled him in the spring of 1899,51 but he pitched well for the Reds in 1899 and 1900. In February 1901, the St. Louis Republic lobbied for his return to St. Louis.52 The Reds complied by releasing Breitenstein, and he signed with the St. Louis Cardinals. After he pitched poorly in three starts, though, the Cardinals released him. Breitenstein “gave no indication of any of his former prowess, and the necessity of reducing [the Cardinals] to the League limit of 16 men by May 15 forced his release.”53 This ended his major-league career, a few weeks before his 32nd birthday. Breitenstein had thrown 301 complete games in the major leagues, establishing a record for southpaws that has been exceeded by only Eddie Plank and Warren Spahn in major-league history through 2015. 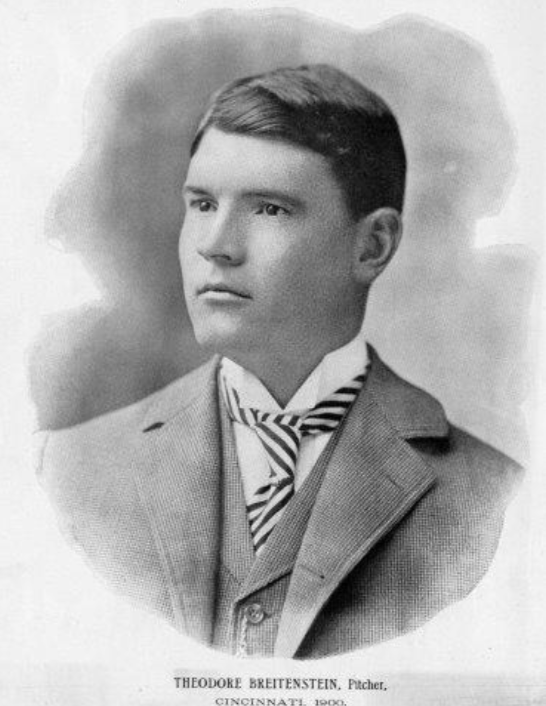 Breitenstein still had the stuff to pitch in the major leagues, but he turned down a chance to join Connie Mack’s Philadelphia Athletics in the spring of 1903.60 With six shutouts and a 17-11 record, Breitenstein helped the Egyptians win the 1903 Southern Association pennant. On September 19 his triple knocked in two runs in his 3-0 shutout of the Atlanta Crackers; the Memphis “crowd went frantic and a subscription of $75 was taken up for the pitcher.”61 Despite the appreciation shown in Memphis, Breitenstein was loyal to manager Frank and followed him the next season to New Orleans. New Orleans won the 1910 Southern Association pennant by a comfortable eight-game margin over second-place Birmingham. Breitenstein compiled a 19-9 record and a 1.53 ERA, with eight shutouts; however, the brightest star on the Pelicans was Shoeless Joe Jackson, a sensational 22-year-old center fielder who led the league with a .354 batting average. The next season was Breitenstein’s last as a player, and at age 42, he helped the Pelicans win another pennant. He stayed in the Southern Association as an umpire from 1912 to 1918. Have made the journey far. 1 In 2015 Baseball-reference.com indicated that Breitenstein had earned 160 major-league wins and 165 minor-league wins, for a total of 325 wins in professional baseball; however, his 1891 minor-league record is not included in this tally. 2 Alfred H. Spink, The National Game, 2nd Edition (St. Louis: National Game Pub. Co., 1911), 124. 3 Harrisburg (Pennsylvania) Daily Independent, July 9, 1897. 4 Although record books give his name as Ted Breitenstein, the research for this biography found no evidence that he was called Ted by his contemporaries. 5 The Sporting News, April 5, 1934. 6 Ancestry.com. Theodore’s middle initial is given as “J” in the 1910 US Census and in 1895 and 1917 St. Louis city directories. 7 Spink, The National Game, 53. 8 The Sporting News, April 5, 1934; St. Louis Post-Dispatch, March 16, 1890. 9 Chicago Tribune, April 29, 1891. 10 Fort Wayne (Indiana) Sentinel, August 6, 1891. 11 The Sporting News, February 21, 1929. Breitenstein (1891), Bumpus Jones (1892), and Bobo Holloman (1953) were the only pitchers to throw a no-hitter in their first major-league start, through 2014. 12 Sporting Life, March 12, 1892. 13 Pittsburgh Dispatch, April 16 and 23, 1892. 14 Sporting Life, April 30, 1892; Brooklyn Daily Eagle, May 7, 1892. 15 Brooklyn Daily Eagle, May 15, 1892; Los Angeles Herald, May 22, 1892. 16 Chicago Inter Ocean, June 7, 1892; Pittsburgh Daily Post, June 11, 1892. 17 St. Paul Globe, June 21, 1892; San Francisco Call, June 25, 1892. 18 Sporting Life, July 2, 1892. 19 St. Paul Globe, September 19, 1892. 20 Chicago Tribune, May 8, 1893; Cleveland Plain Dealer, July 5, 1893. 21 Sporting Life, January 25, 1896. 22 New York World, July 12, 1893. 23 Sporting Life, August 12, 1893. 24 Chicago Tribune, August 5, 1893. 25 Sporting Life, May 12, 1894. 26 Sporting Life, March 17, 1894; Pittsburgh Post-Gazette, July 17, 1894. 27 Kansas City (Kansas) Gazette, May 13, 1894. 28 Washington Times, September 2 and 5, 1894; Philadelphia Times, September 4, 1894; Pittsburgh Post-Gazette, September 7, 1894; Chicago Inter Ocean, September 9, 1894. 29 Sporting Life, September 13, 1894; Scranton (Pennsylvania) Tribune, September 14, 1894. 30 Springfield (Missouri) Leader, September 17, 1894. 31 Richmond (Virginia) Dispatch, September 16, 1894. 33 Sporting Life, September 22, 1894. 35 Sporting Life, December 9, 1893, and November 24, 1894. 36 Sporting Life, October 31, 1896. 37 Philadelphia Times, January 26, 1895; Sporting Life, March 9, 1895. 38 Pittsburgh Daily Post, August 5, 1895. 39 New York Tribune, June 9, 1895; Pittsburgh Daily Post, July 9, 1895. 40 Brooklyn Daily Eagle, July 25, 1895; Sporting Life, August 3, 1895. 41 Sporting Life, July 20, 1895. 42 SABR, The SABR Baseball List & Record Book: Baseball’s Most Fascinating Records and Unusual Statistics (New York: Scribner, 2007), 266. 43 Sporting Life, July 13, 1895. 44 Sporting Life, June 22, 1895. 45 Cincinnati Enquirer, July 19, 1897. 46 The Sporting News, July 3, 1897. 47 Sporting Life, August 13, 1898. 48 Cincinnati Enquirer, April 16, 1898. 49 Chicago Tribune, April 23, 1898. 50 Sporting Life, August 27 and September 10, 1898; Kansas City Journal, December 18, 1898. X-rays were discovered in 1895 by Wilhelm Roentgen. The X-ray of Breitenstein’s arm in 1898 is an early example of the use of X-rays in sports medicine. 51 Louisville Courier-Journal, May 8, 1899. 52 St. Louis Republic, February 3, 1901. 53 St. Louis Post-Dispatch, May 12, 1901. 54 Minneapolis Journal, June 3 and August 16, 1901. 55 St. Louis Republic, August 31, 1901. 56 Sedalia (Missouri) Democrat, December 9, 1901. 57 Sporting Life, January 25, 1902. 58 Atlanta Constitution, March 31, 1902. 59 New Orleans Times-Picayune, June 25, 1902. 60 Mansfield (Ohio) News, May 16, 1903. 61 Atlanta Constitution, September 20, 1903. 62 Washington Times, September 2, 1905; Atlanta Constitution, September 9, 1905. 63 Washington Post, December 12, 1905. 64 Sporting Life, October 3, 1908. 65 John A. Simpson, The Greatest Game Ever Played in Dixie: The Nashville Vols, Their 1908 Season, and the Championship Game (Jefferson, North Carolina: McFarland, 2007), 25. 66 Cleveland Plain Dealer, March 28, 1909. 67 New Orleans Times-Picayune, August 16, 1909. 68 Sporting Life, September 4, 1909. 69 Sporting Life, September 18, 1909. 70 The Sporting News, April 5, 1934. 71 The Sporting News, February 21, 1929. 72 St. Louis Post-Dispatch, May 10, 1896. 75 Cleveland Plain Dealer, May 4, 1935. 77 New Orleans Times-Picayune, July 30, 1910.